The main obstacle keeping the human race from colonizing the solar system is the first 160 kilometers. Climbing out of Earth's gravity well is difficult, dangerous, and extremely expensive. Today, it costs over $10,000 to put just a single pound of payload into orbit, and a single flight of the Space Shuttle costs over a half billion dollars. Yet this is not a situation unique in the history of exploration. In the early 1800s, overland travel across the American Frontier was equally arduous and wallet-heavy. Lewis and Clark's famous expedition proved to be two years of expensive preparations and frustratingly slow progress. Some scholars at the time thought it might take over 800 years to colonize the American West. Yet by the end of that century a new technology -- the railroad -- had accomplished the task in only a few short decades. Our difficulties in achieving orbit might be solved by a similar method -- by building a railroad track straight into space. Space Elevators are sometimes nicknamed Beanstalks. Originally proposed along with Sky Hooks in a popular science article in the Soviet periodical Komsomolskaya Pravda by Yuri Artsunatov in 1960, the concept of Space Elevators has been taken up by many science fiction writers over the years, most significantly Arthur C. Clarke in his 1977 novel The Fountains of Paradise. Since then, it has seen many incarnations, such as in Kim Stanley Robinson's Red Mars novel, the game universe of 2300 AD, the Dirty Pair and Maps anime series, and countless science article speculations. It is currently under serious preliminary study at NASA's Institute for Advanced Concepts. 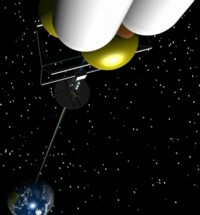 The basic principle of a Space Elevator is fairly simple to envision. Tie a string to a baseball and twirl the string above your head. The string will remain taut and straight as long as the twirling motion is in effect. The Earth is spinning far faster than your hand could ever manage, at about 1,600 kilometers per hour. If you anchored an incredibly strong wire to Earth's surface at the equator, then attached the other end to a large enough mass (say, a small asteroid) to keep it taut, you would end up with a perfectly-straight railroad track right into space. The Space Elevator's center of mass would be at geosynchronous orbit, approximately 36,000 kilometers above the equator, helping to keep the entire construct fixed over a stable position on Earth. The geosynchronous point is also where the cable would be under the most stress, so it would have to be thickest there and taper exponentially (by as much as ten or twelve to one) as one moves away from it in either direction. Once the cable is set up, elevators can ride up and down it via electromagnetic rails, delivering cargo straight into orbit. The Earth-end of the elevator cable is usually envisioned as being attached to the top of a mountain or a super-high artificial tower. However, though both of these options could simplify setting up the elevator, they are not strictly necessary. One scheme, involving the photocell climber elevator (see below), details anchoring the cable to a specially-built but standard-height off-shore platform. The Space Elevator is a simple, straightforward idea with one very serious complication: the structural stresses put on the elevator cable would be truly enormous, far beyond what most materials available today, even advanced alloys and composites, are capable of dealing with. A GigaPascal (GPa) is a measurement of tensile strength. Quartz fiber has a tensile strength of about 20 GPa, while diamond filaments would only be slightly higher. The tensile strength required for Space Elevator cable material is around 62 GPa. Also, the heavier you make the cable, the more weight it has to support and the greater stress it has to endure. So, ideally, the builders of a Space Elevator would not only have to have an incredibly strong, flexible material that can be spooled like cable, but said material also would have to be incredibly light-weight. Fortunately, one material meeting these requirements has recently been synthesized, albeit only in microscopic quantities: carbon nanotube composites, which would have a theoretical upper tensile strength of 200 GPa, over 100 times that of steel cable at only a small fraction of the weight. Small fibers of this material can be set down side by side, then interconnected to form a growing ribbon. One interesting feature of the system is that the Space Elevator cable would constantly be moving through Earth's electromagnetic field. If conductive material (or even superconductive material, if such is available in quantity when the elevator is constructed) were run through the center of the cable, it would constantly generate electricity through this movement. This could provide not only ample power to operate all the Space Elevator systems and stations, but also provide an electromagnetic field, on which transport cars could ride the elevator, through magnetic levitation. Using 1 g acceleration/deceleration for the elevators, a trip from the ground to the geosynchronous point would take about two days. Once the technology matures, orbital interface travel from surface to space is estimated to be reduced to less than a thousand dollars a ton for cargo, or a rate equivalent to a passenger train for human riders. Today it costs about $22,000 per kilogram to put cargo into Low Earth Orbit because of the enormous energies standard rockets must generate in order to reach orbital velocity. Using today's energy costs, it would take about 75 cents per kilogram for a Space Elevator to do the same thing. A Space Elevator would pay for its initial set-up costs in a few decades. The builders could even make money by selling the delta-V of the Space Elevator to outbound ships, flinging them into space from the far end of the cable much like an oversized slingshot. A ship "flung" from the end of the cable would be travelling at about 10.86 kilometers per second, fast enough to reach Mars in a few weeks if pointed in the right direction. In most visions for a passenger-carrying elevator, a way station is usually built at the geosynchronous point, where the local net acceleration forces along the cable cancel each other out, resulting in zero gravity conditions. 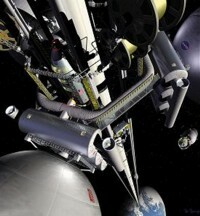 Artist Pat Rawling's concept of a space elevator viewed from the geostationary transfer station looking down along the length of the elevator toward Earth. Image courtesy of NASA. This concept uses photocells "pushed" by a ground-based laser to slowly build a Space Elevator "from the ground up." The elevator cable anchored to the ground is counter-balanced by an equal length of cable beyond the geosynchronous point, built up by photocell-pushed "climbers." These climbers would also be used to launch smaller payloads up the elevator. The initial "seed" cable is launched from Earth by conventional means to geosynchronous orbit, where it unspools twenty tons of carbon nanotube composite cables, snaking it down to Earth to an ocean-based anchor station. Once secure, a platform-based multi-megawatt laser is used to beam photo-cell laden "climbers" up the cable, using the continual pressure of its high-density light beam to inch it skyward. Each climber trails more carbon nanotube ribbon behind it, adding to the overall strength of the initial cable. After two and a half years, using nearly 300 such climbers, the nascent Space Elevator is ready to begin launching cargoes of up to 20 tons of mass. Bradley Edwards of Eureka Scientific, based in Berkeley, California, estimated in a Space.com interview that a photocell climber Space Elevator could be built within 15 years and cost as little as $10 billion dollars for initial set-up costs. The more "traditional" vision of a Space Elevator, and the kind most commonly used by science fiction writers. In this scheme, a small asteroid is diverted from deep space and locked into high orbit above Earth. The end of the elevator cable beyond geosynchronous orbit is anchored to it as a counterweight (think of the baseball in the above example). The mass of the asteroid moving in a higher orbit keeps the cable under tension and the cable straight. This way, the overall length of the cable beyond geosynchronous orbit can be greatly shortened. A shorter cable may be desirable for economic reasons. Today, carbon nanotubes cost about $500 per gram of mass, or roughly $500 million dollars per ton. A Space Elevator cable will, of course, weigh many thousands of tons. If the price of this material does not significantly go down by the time a Space Elevator is ready for construction, diverting an asteroid may actually be a far cheaper deal than building an equal length of cable beyond geosynchronous orbit. The asteroid could also have the added advantage of being used as a source of raw materials to build space facilities for the elevator, such as the geosynchronous station, or complete additional cables for more "tracks" along the elevator. It can also be honeycombed or even hollowed out for use as a ready-made space habitat. An alternative method to the Space Elevator for building a railroad into space is the Space Fountain. This concept was pioneered as a collaborative effort between Robert L. Forward, Marvin Minsky, John McCarthy, Hans Moravec, Roderick Hyde, and Lowell Wood. An extensive amount of information on the concept can be found in Robert L. Forward's book, Indistinguishable From Magic. A Space Fountain uses a continuous stream of electromagnetically accelerated metal pellets to hold things up at extreme altitudes using the same basic physical principles that a water fountain uses to suspend a plastic ball at the top of its vertical jet of water. Small metallic pellets by the millions would be shot up to a "deflector" station far overhead, which would use magnetic field scoops to catch the pellets, curve them back down with an electromagnetic accelerator, then shoot them back down to the ground. The ground station would in turn use a magnetic scoop to catch the pellets, curve them back up with a powerful electromagnetic accelerator, and shoot them back at the station in one continuous loop. The pressure exerted on the magnetic fields of the scoop and curved EM accelerator by the continuous stream of pellets would keep the station aloft. The key to understanding the Space Fountain is that it uses a continuous, as in non-stop and never-ending, stream of pellets to constantly exert pressure on the station it is holding up. Think back to the water fountain analogy; the way it can keep the ball suspended on its jet of water is by continuously recycling the water; the water that falls back into the fountain is sucked up by the fountain's intakes and fed back into the water jet in a never-ending loop. The same with the metallic pellet "jet" of the Space Fountain. Also, it is important to understand that the pellets and the suspended station never actually make physical contact; the magnetic fields of the scoop and curved accelerator act as a kind of buffer, preventing any physical damage from the pellets screaming at the station at over 4 km/second. Yet the pellets exert pressure on the magnetic fields as they pass through them, and this force is in turn passed on to the physical structure of the station, holding it aloft. Using this technique, it is thought the fountain could hold up a full-sized, fully-equipped space station of 40 tons or more at almost any altitude, even Space Elevator heights of 40,000 kilometers plus. However, the higher the station, the higher the required start-up and maintenance energy (see below). A Space Fountain of about 2000 kilometers in height is thought to require the constant input energy of a modern city to maintain; it therefore may not be too economically viable to build fountains much higher than this. For the purposes of building a tower capable of launching vehicles into orbit, 40 to 200 kilometers or so may be more than sufficient height. One advantage of the fountain is that once the system is set up, the energy needed to maintain it would be much less than its start-up energy. The loss of momentum from gravity as the stream is shot up is exactly balanced by the gain in momentum due to gravity as the stream is shot down to the ground station again, and at no time does the total momentum of the system change. Entropy does dictate that some energy will eventually be lost over time, but this can easily be continually compensated for by auxiliary power stations at a small fraction of the energy needed for the system's initial set-up. Thus, even if all power were cut to the pellet stream, it would still function normally for a while, and it might take up to several hours for the suspended station 1000 kilometers or more up to feel even a wobble. Space Fountain structures, if ever built, will in all likelihood be built with multiply-redundant support streams; Forward in his book mentioned a minimum of three, with up to six or eight per individual structure, each with its own independent power supply. In Forward's SF novel Starquake, the alien Cheela built a number of hexagonal Space Fountain structures, with six separate fountains each holding up a "side" of a hexagonal deflector station. Another advantage of the Space Fountain is that the system can literally be built from the ground up. The ground station and the deflector station with their respective accelerators would both be fully constructed on the ground, and the station placed on top of the ground station with their accelerators aligned. Then the fountain is powered up slowly, the force of the pellet stream eventually lifts the station first a few centimeters, than a few hundred meters, and then is pushed up kilometer after kilometer. The process can be suspended at any altitude, from a few centimeters to a few thousand meters, indefinitely, allowing for calibrations, maintenance, new construction, and so on. If the support streams are sufficiently over-powered, i.e. carrying more than the needed energy to hold just the deflector station aloft, the fountain can also be used to support side structures such as elevators or walls along its length. Like at the deflector station, electromagnetic accelerators/decelerators can be built vertically along the stream as the fountain is slowly built up, drawing upon the force of the pellets passing through magnetic fields for support. Since the wall sections (and any internal structure they themselves may support) are held aloft by the internal stream passing through them, they are under no extraordinary structural stress themselves, as one might suspect from a structure that may be hundreds or thousands of kilometers high. Thus Space Fountains can be used to create truly gigantic structures and towers as well as used merely to hold a space station aloft. And, unlike a Space Elevator, it would not require any extraordinarily expensive materials to hold together; modern-day alloys and composite materials would do just nicely. The most obvious use for such a super-high structure would of course be as an orbital launch tower; line the outer walls with electromagnetic accelerators and shoot a payload up the side. A fountain tower about 40 kilometers high would be sufficient to launch passenger-carrying vessels to orbit with less than 3 g of acceleration. A fountain tower 100 kilometers high or higher could simply fling the cargo directly into orbit without exceeding one g.
A fountain tower could also be used as a super-sized arcology, research facility, industrial center, or more as a fountain 100 kilometers high and 100 meters wide at its base would have about 7.85 entire cubic kilometers of volume the designers could use for just about anything. Higher and wider towers, with many thousands of cubic kilometers of interior space, are also possible. Forward suggests that Space Fountains would first have to be demonstrated on a "small" scale, first used in building kilometer-high transceiver towers and such for radio and television broadcasts. The technology can then be scaled up to support super-highrises, and then finally a true Space Fountain. A computer model of a maglev vehicle. Image courtesy of NASA. So what exactly are the chances of a Space Elevator or a Space Fountain ever being built? In the long term, it is probably inevitable. Though their initial construction costs may seem exorbitant, they will quickly pay for themselves not just by making orbital travel cheaper and easier but by making space-based economies truly viable for the first time in history. They are just too good an investment for future generations to ignore. But in the short term, as in within our lifetimes, the question as to whether we will ever see an orbital tower is unanswered. The technologies needed to create them will most likely come on line in the next decade or two. But given the long-standing conservatism in both the aerospace community and the government and corporate agencies that fund it, exotic concepts such as the elevator and fountain could prove to be a very hard sell. However, if enough pressure is brought to bear by both the scientific community and space proponents, it is possible they could be made to see that the advantages may be well worth the investment. After all, just as many who saw the first steam engines never thought they would transform a continent, so too are most people today unaware that the opening of the solar system to mankind is just a single railroad track away. Paul Lucas is a freelance writer and artist hailing from the wilds of Erie, Pennsylvania. His previous publication in Strange Horizons can be found in our Archive. To the Moon in a Space Elevator?, an article published at Wired.com. 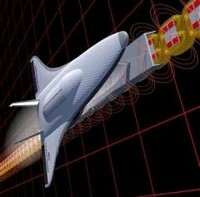 Audacious & Outrageous: Space Elevators, an article published by NASA. The Space Elevator -- A Eureka Scientific "Key Project"